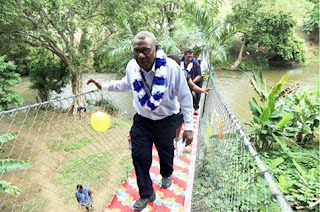 PNG Power Limited recently opened and handed-over a newly constructed footbridge, to the people of Furimuti village, on the outskirts of Port Moresby city. The 50 metres long, suspended Cable Footbridge cost PPL just over K200,000 and was constructed by the Department of Works under the Government’s Public Private Partnership program. Officiating at the occasion was PPL’s Chief Executive Officer Mr Chris Bais, accompanied by his Acting General Manager-Corporate Service Mrs Cathy Sigiamo, Acting Manager Lands and Community Relations Nancy Qwarame and their officers. Mr Bais highlighted to the community, that PPL as a State Agency of the Government, has the responsibility to ensure electricity service is provided to the people of PNG, both in rural and urban areas. “But with that responsibility, also comes with its community service obligations to not only provide this service, but to ensure it provides relevant community support service programs to communities,” Mr Bais said. Furimuti village is one significant community to PPL, as they have given up their customary land to PPL, to erect 10 of its Transmission Towers to link up Rouna Hydro powerstation to it’s Moitaka powerstation. This community’s sacrifice, had them relocated to the banks of the Laloki river, which for the last 40 years, they have been greatly affected when the river floods. According to some local women there, lives have been lost just for the sacrifice to cross the flooding river to have access into Port Moresby city for food rations and other household needs. But as Mr Bais highlighted, this community service of constructing them a Suspended Cable Footbridge, will ease their struggles crossing the Laloki River. Mr Bais also called on the local community leaders, to take good care of the footbridge, to ensure it serves its purpose, and not to be destroyed by their own neglect. The Works Department, was represented by the Assistant Secre¬tary-Rural Infrastructure Program Mr Easo Joe Roroi, and his officers, also made a similar call to the people, that maintenance will only come, when the structure fails, and not when intentionally damaged by villagers.